If you have a rat problem in your home or place of business, you want to respond to the threat before it gets out of hand. Rats can cause issues and spread if you don’t stop them during the first signs of trouble. You could be wondering what steps you should take to get your rat issue under control, which is not as difficult as you might think. This Tomcat rat poison review explores the benefits you can get from using this brand of rat killer the right way. 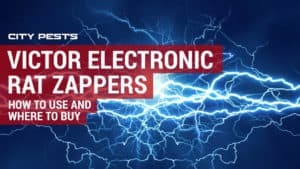 As you review this comprehensive guide, you will discover the many problems rats can cause and why you should not overlook the threat if you care about your home or office. Having the right tips near the front of your mind can make a major difference in the outcome you can expect. See Tomcat rat poison on Amazon (click for full range and prices). You don’t have to let rodents invade your home and take over your life as long as you keep a level head and focus on your long-term goals. Many people try solving rat problems without learning proven steps, and they often encounter a lot of issues because of their oversight. Read this guide from start to finish to defeat that roadblock and to give yourself the best possible odds of solving the problem without unneeded stress. 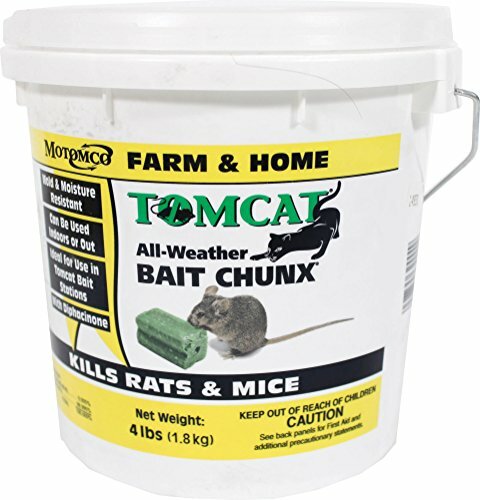 Tomcat All Weather Bait Chunx is a fantastic rat killer for those who want to keep rats away from their property. When you find out you have a rat problem and want to do something about it, turn to Tomcat poison for results you can trust. 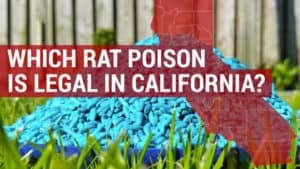 You can use Tomcat rat poison to keep rodents out of your home, barn, garage, attic or anywhere else they try to go, and you will be happy when you see the outcome for yourself. Not only does it work quickly, but it’s also resistant to weather and mold, meaning you can use it in almost any environment. Bromethalin is a potent acute toxicant. Rodents stop feeding after eating a toxic dose so more rodents are controlled with less bait. "Kills anticoagulant resistant norway rats, roof rats and house mice." 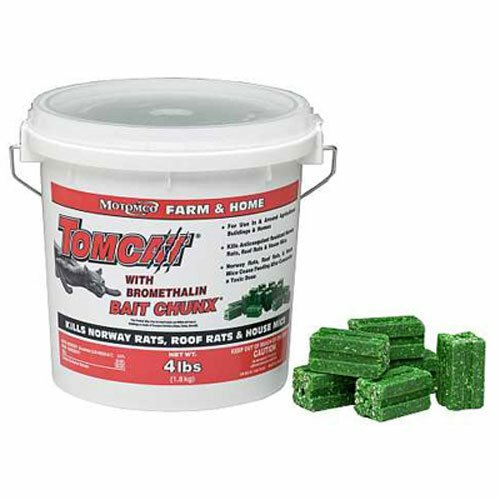 Tomcat Bait Chunx Pail 4 LB is the next rat poison on our list, and plenty of people have already enjoyed positive results from using this product. With a four-pound bag of rat poison, you are sure to get your rat issue under control sooner than you once thought possible. It uses bromethalin for increased effectiveness on rats that have become resistant to standard anticoagulant poisons. The rats that have invaded your property won’t know what hit them, and the speed at which they disappear will make you smile. Send your rats away for good with this product. The fast-acting toxin gets rid of rats quickly so that you won’t have to keep worrying about them and the things they can do to your property. Whether you want to protect yourself from pathogens or reduce the odds of a fire, this poison meets your needs in a way you won’t be able to ignore. Here is the list of cons you can review to get an idea of whether or not this option makes sense for you. Some people report that this product works best on small rats and that you could have trouble getting decent results with large rats. If you still notice rodent activity after deploying this poison, increase the dose to enhance its effectiveness. Motomco Tomcat Rat And Mouse Bait Pellet is the last poison on our list and packs a big punch. You get 10 pounds of Tomcat rat killer poison to manage infestations of all sizes. In fact, you will likely have enough left to use in the future if the need arises. 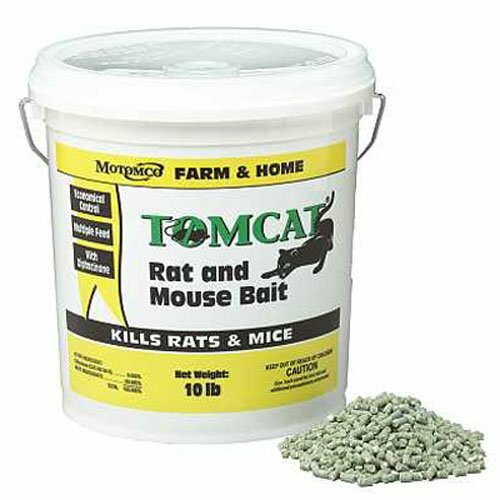 Like the other products offered by Tomcat, this poison gives you results that turn your rodent concern into a thing of the past. It provides results you can trust and lets you put your mind to rest because rats that eat it will likely die within 48 hours. One of the best things about this product, though, is that rats stop eating after they consume enough for the poison to be effective. This means each batch of poison you buy will go much further. Killing rats within 24 to 48 hours lets you reduce your rodent population without unneeded setbacks, roadblocks or delays. You get a simple solution that does what it promises. Some rat poisons are not effective against Norway rats, leaving you without many options when they invade your home or place of business, but this Tomcat product handles Norway rats as well as it handles other types. While this product does its job in most situations, some people report mixed results compared to the other types of Tomcat poison. You can still get rid of your rats if you are dealing with a small to moderate infestation, and it should not take longer than the other types to which you have access. No matter what you do, ensure that you keep this product away from your children and pets because it can harm them. Some people buy one of these poisons and sprinkle it in and around their home, which works when killing rats is your only goal. However, that approach can put pets and children in harm’s way, a risk you can’t afford to take no matter how bad your rat problem is. Instead of taking unneeded risks, use your rat poison the safe way with Tomcat Rat and Mouse Killer bait station (see on Amazon). The rats can smell and access the poison, but your children and pets won’t, putting your mind at ease. Recommended reading: How long does Tomcat rat poison take to work? You now know everything you need to make a wise buying decision, but you should still take a few more safety tips into consideration. 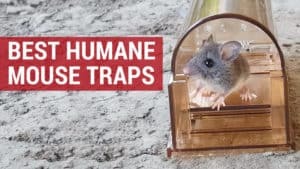 If you look at all the Tomcat rat killer products in this guide, you will find a common con for each one; these products are harmful to children and pets. To enjoy the rewards of this product without putting yourself in a bad situation, make sure children and pets don’t have access to your bait stations. You also want to store your bucket of Tomcat rat poison in a location to which they don’t have access. If your children are old enough to speak, make sure they know to avoid the poison and to stay away from the rat traps at all times. Those who don’t understand rat behavior or why these invaders are a threat are not as likely to take action as those who do. 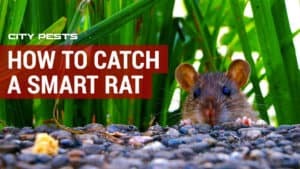 If you want to make the smart decision for you and your property, learn what to expect if a rat issue gets out of control. You will then move forward with confidence because you will know what the most likely outcome is. The first issue with rats getting into your home or place of business is that they can spread diseases. When these rodents get inside your kitchen, they taint your food and drop waste before they leave. These contaminants can put you and your family at risk for a variety of harmful pathogens. Rodents chew wires when they enter the walls of a building, and this chewing can cause a short-circuit to form. You will then be at risk for fires that could destroy your property, cause injuries or do something much worse. Doing everything you can and taking every possible step to reduce these threats is critical, and it could even save a life. Learning about and using the best rat poison for your situation is a smart way to stay ahead of the problem and maintain your sanity. It’s not hard to see that combating rodent infestations before they start is the ideal solution. 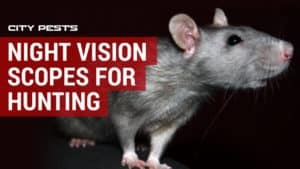 Now that you have a clear picture of the issues you could face when rats get out of control, it’s time to explore some of the reasons they could be targeting your property. Rats want shelter, food and water more than anything else, so your home is an attractive option when it offers any of those things. As far as shelter is concerned, rats enjoy cluttered environments because they have plenty of places to hide and create a nest. In addition to attracting mice, clutter also makes it much harder for you to spot the invaders during the early stages. The good news is that you can try several things to make your home a lot less inviting to these creatures, and the outcome will make you smile. Since rats enjoy clutter, keeping the spaces inside and outside of your home clean and clutter-free is a powerful step toward your goal. You can also clean up spills the second they happen and keep open bags of food in sealed containers. The fall months are the most likely time you will face an infestation because rats want a warm place to survive the winter. You can go outside during the last months of summer and make sure your foundation and walls don’t have any cracks. Fear and disgust are the feelings most people have when they discover their home has a rat infestation. A lot of people already understand the importance of taking action at the first sign of rats, but others are not that motivated. They will try one or two tips they found online with hopes of getting rid of the unwelcomed guests. Some people know how critical it is to contain the threat but still think the methods they learned online can help, but that is not always the case. Inability to control a rat issue when you first notice it gives it plenty of time to spread. In fact, two rats can become 2,000 in 12 months if nobody steps in and puts a stop to them. In addition to spreading, rats continue causing damage each day you let them stay on your property. The amount you have to pay in repair bills will skyrocket unless you take prompt action and eliminate the invaders before they have time to cause even more issues. Your odds of getting sick increases when the number of rats on your property is on the rise. If you don’t want to get a harmful pathogen, use Tomcat poison as soon as you learn of a rat infestation on your property. While most of the products on our list provide similar results, the main difference is that the all-weather product works outside and inside. 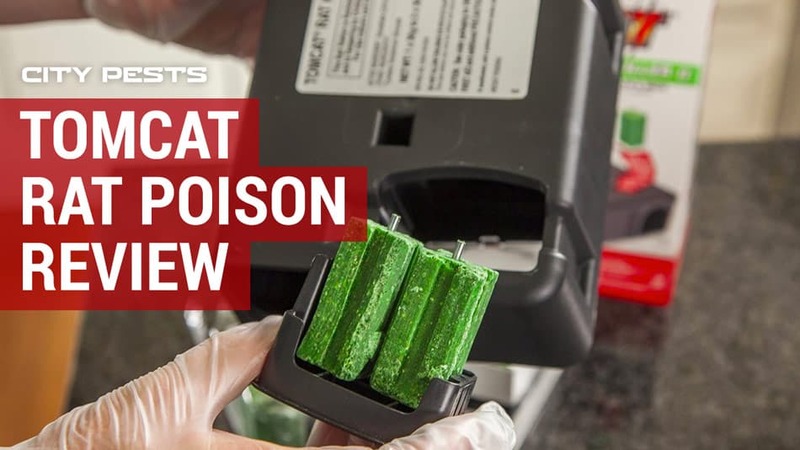 You should now know what product you need for the results you want, and combining the proper poison with a quality bait station is how you get rid of your rats for good. You will be thrilled when you see how effective these products are against rats that would otherwise be difficult or impossible to manage. You can reclaim your property and teach your unwanted guests a lesson they will never forget. 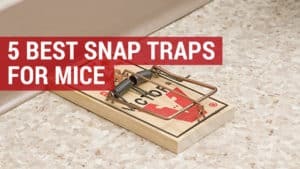 For many people, the biggest benefit they get is knowing they have the power to stop rat infestations in their tracks, containing them before they cause any more harm. If you have never given Tomcat poisons a try, the outcome you get will surprise you. 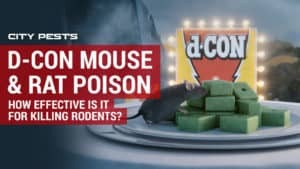 D-Con Mouse & Rat Poison Review – How effective is it for killing mice? PrevPreviousHow Fast Do Bed Bugs Spread From Room To Room?